Are you looking for new ways to encourage your students to read and write with greater effort and enthusiasm? Students in Lexington, Kentucky, have demonstrated both since their district formed the Literary Book Club -- an online forum that offers students a real audience and real incentive. Included: Resources to help you create a Literary Book Club for your school. Read any good books lately? If you have, probably the first thing you did when you finished reading was share the experience with a friend. Kids in Lexington, Kentucky, enjoy sharing their favorite books too, but they aren't limited to passing the word to a few close friends. When those kids read a good book, they can share it with everyone in the Fayette County Public Schools' family -- and with interested readers around the world -- through the district's Literary Book Club. The Literary Book Club isn't your average book club, however; it's actually an online literacy forum. Developed by Fayette County Public Schools' technology resource teachers Cathy Brandt, Barbara Hardy, and Amy Ford, the Web site is designed to promote student literacy by encouraging students to read books and share their thoughts about those books. In the process, the Book Club also helps students and teachers develop and practice their technology skills. The Literary Book club is meant as a place for students to share their love of reading. Reading great books opens new worlds to all who wish to enter. The main component of the Literary Book Club is the site's Get Published! section. Here, students in grades K-12 are guided through the writing process as they create reviews of the books they've read. The site's "book review wizard" provides step-by-step directions for creating a review, from entering the book's title and author, through summarizing the story and reacting to it. In addition, the wizard allows students to upload a photograph or drawing to illustrate their reviews. The learning doesn't stop with the wizard, though; as students write their reviews, their teachers read and evaluate them, offering online conferencing and editing suggestions. "Students can't register for the Book Club unless their teachers do," technology resource teacher and Book Club committee member Mike Johnson explained to Education World. "So, when students register to use the site, they sign up in their own teacher's class. When teachers log on to the site, they access the reviews of students in their own classes, add comments, and offer suggestions for improvement. Students read the comments and make the appropriate changes. Then, when the review is satisfactorily completed, the student's teacher marks it as approved, and the review is displayed on the public site. Visitors to the site can read only those Book Reviews that have been approved by a teacher." According to Johnson, the site, which is in its fourth year of operation, currently contains more than 1,400 book reviews -- 800 from last year and about 600 from the two previous years. This year, the site underwent a major redesign to include more interactive features; since going back online in January 2003, the site has registered 81 teachers and 442 students. More than 300 reviews have been submitted since January; 40 of those have been approved to date. In addition, visitors to the site have read more than 750 new and archived reviews in 2003. 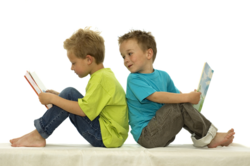 Don't miss these additional literacy resources from Education World! * Make It Happen: Awesome Author and Illustrator Visits! * Get to Know Your Favorite Authors -- On the Internet! * Better Book Reports -- 25 Ideas! * LitTips: 12 Practical Tips to Improve Literacy! "Teachers like the site," Johnson said, "because it helps them give students a purpose and an audience for their writing. They like being able to log on to the site to see what students are writing, and being able to add comments to each part of the review. Teachers have reported that the site has increased their students' desire to read and write. "Students are eager to have their work published online and they seem more interested when they're writing for a real audience," Johnson added. "They can show their reviews to their parents at home, and e-mail the link to distant friends and family." As an additional incentive, Johnson noted, students who publish five reviews on the site, as well as those whose reviews are chosen as Featured Submissions, are awarded a certificate and a free book from the Literary Book Club committee. Students don't have to read or write a review to enjoy the Literary Book Club, however. The site's Kid's Korner also includes Create Your Own Adventure, an activity similar to Mad Libs, in which kids put their own words into a pre-written story. The Literary Book Club also offers extensive resources for teachers. One of the newest is the site's Bookchat feature. Here, teachers can arrange for their classes to "chat" with other students in the district about the books they've read. To schedule a book chat, teachers fill out a form listing the book they want to discuss, the grade level(s) of their students, and the date and time they would like the chat to occur. Project coordinators schedule the chats and list chat times and topics on the Web site. Interested teachers can view upcoming chats and sign up for any that are appropriate for their students. The newly redesigned Literary Book Club site also recommends a Featured Site of the Week -- a student or teacher Web site that promotes literacy -- and provides a Book Lists page, which offers links to Web sites containing lists of books that might be of interest to students or teachers. In addition, the Teacher Section provides extensive directions for using every section of the site, printable versions of all awards and certificates, and printable and online versions of writing process worksheets. "This is definitely a project I would recommend to other districts," said Mike Johnson about the Literary Book Club. "A tremendous amount of work went into the design and programming of the site, but it has proven to be well worth the effort." Johnson encourages teachers, administrators, and/or technology coordinators to contact one of the Literary Book Club committee members for more information -- or for assistance in setting up a Literary Book Club for your school or district.